- Please describe current Baduk situations in Europe. We believe that About 50,000 people total 37 countries enjoy Baduk In Europe. And about 10,000 people are regarded who attend tournament which is adopted ranking system. 10,000 people are who enjoy Baduk a lot, and other 40,000 people rarely attend the tournament but they enjoy Baduk in their country. - How many tournaments are there in Europe? I can¡?t count it all. I think there are about 300~400 tournaments and there are also Baduk camps and other small events. For example, In Germany there is a tournament in every weekend. About 600~800 people attend the EGC which is held for 2 weeks. We believe that we are capable to have this size tournament in Europe and we have enough experience. - It is said that Europe also is ready to have Pro system. We are just in preparation step. At the end of next year, 2 players are supposed to become pro and have pro tournament in 2015. All pro players from Korea, China and Russia who are living in Europe can join this pro tournament. - To pursue this plan, financial aids should be prepared first. We heard that Korea supports America pro system, and then China supports Europe pro system. China Association promised to support EGF with long term plan. We focus two matters. First is to support high level players to improve their level, and second is to strength EGF¡?s function and role. We already communicated well with this matter with China Association and now we are preparing those things with support from CBA. - What is China Association? It is private agency. Baduk lovers from China gather their power and make this private agency. Their aim is to support only for Europe Baduk. - How did you know about Baduk and level? I have known it for the first time when I studied in Berlin university in 1967. My major was mathematics, but I found Baduk paper in the notice board. From that time, I studied Baduk and became 1Dan, but after that I think my level down to 2 Kyu. But I am confidence in managing Baduk tournament and events myself. 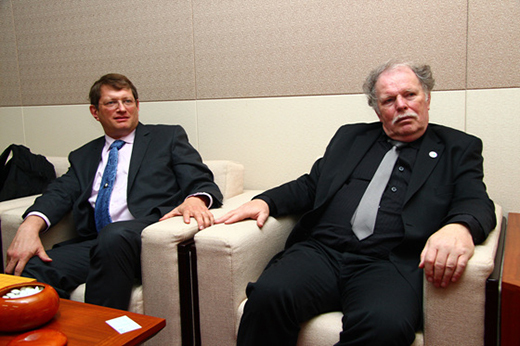 - AGF(American Go Association)has much with Korea. How many times have you visited Korea? It is my third time. I attended Kim In Cup two times before and this is third time. - Have you counted total Baduk people in America? I have not counted it but I think it is about 5,000 people. It means 5,000 Americans and other 20,000 people enjoy Baduk here in America who have moved to America from other countries. - How many members does AGF have? Currently about 2,000 people are enrolled and they pay $30 per year. Baduk clubs are known to be about 100 and about 100 tournaments are opened in America. - U.S Congress is the biggest one? Yes, it is. It has been held for 29 times and about 350~500 people attend every year. - Last year, two players became pro, but this year there was no. This year, there was no sponsor, so it is postponed to next year. But prelinary league has been finished all and we are ready when we have sponsor. Next step is to make pro tournaments in America. We estimate about 12 pro players are living in America including Kim MyongWan 9Dan from Korea and Peng Win 9Dan from China. - Can you explain the history of Baduk in America? I think it has come to America in 1880~1890. Its function has been kind of community among Chinese and Japanese. In 1937, one of Chess player organized AGF in New York. - How did you know about Baduk? I have known Baduk since my university years. Mother misunderstand between Chinese chess book and Baduk book. She bought me Baduk books at that time, but I fell in Baduk when I taught it to my son and daughter. - What image dose Baduk have in America? Many people than expected have heard of Baduk. Its image is university years as many people learn it when they are in university students. And they spread it to others.